AP classes are an excellent way for advanced students to challenge themselves, and they have the chance to earn college credit with the AP exam at the end of the year. Some students graduate with enough AP credit that they are able to graduate a semester – or more – early. That’s enough to make every parent’s heart sing! Let’s take a look at the basics you need to know about AP classes and tests for this school year. Generally, getting into an AP class is done through your high school’s registration process. However, it is possible to take AP classes that your school does not offer. It’s also important to know how to register for AP classes if your student is homeschooled or attends a high school without AP classes. There may be prerequisite classes before your student can choose an AP class. For instance, they may need to take an introductory chemistry class before you can enroll in AP Chemistry. If your student wants to get AP credit but your school doesn’t offer the class, or your student is homeschooled, all you need to do is make sure they register for the AP Exam. From there, they will need to study and prepare for the exam themselves, without a class. The good news is that there are online AP classes that your student can take advantage of to help them prepare! Your student can take as many AP exams each year as they would like, but keep in mind that you have to pay for the registration each time. If they aren’t able to prepare well for multiple exams a year, it would be better to spread them out! Your student can repeat an AP exam they took the previous year to improve their score. However, both exam scores will be reported unless your student requests that one is withheld or canceled. If your student is taking an AP class at their high school, the teacher will probably let them know what the test registration process is and when the forms and payment are due. Some teachers will even set aside class time to walk students through the registration process! Even if this doesn’t happen, an AP teacher is a great resource for any questions you have about the exam. Another resource at your child’s high school is the AP coordinator, who should have information about all of the exams, dates, and deadlines. The coordinator may be a guidance counselor, so keep in mind that you need to ask questions early so that you have time for them to work you into their schedule. If your student is homeschooled or their high school doesn’t offer AP classes, you still have access to exams. However, you have to do more of the legwork yourself. AP exams have to be taken at a high school that offers AP classes, so check around to find the school nearest you. Contact their AP coordinator and find out how to get your child registered for the target exam(s). You can also contact the national AP program itself no later than March 1, 2018. The 2019 deadline (for 2019-2020 exams) will be in the fall. You can call 888-225-5427 or email [email protected]. So when are the exams? The dates vary depending on which exam your student is targeting. 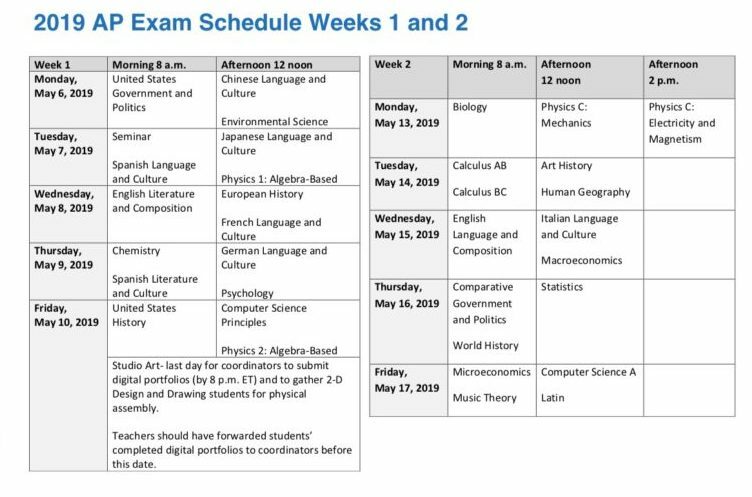 Keep in mind that if your child has exams that conflict, they need to talk to the AP coordinator about getting an alternate testing time set up. AP test dates are available on the College Board website, and range from May 6 – May 17th. For each date, there is a morning timeslot that starts at 8 am and an afternoon time slot that starts at 12 pm. Each test is only available once. For a full list of exam dates and times, visit the College Board website. Of course, every student who takes an AP exam is hoping to score well enough to earn college credit. There are a lot of other benefits to taking an AP class and exam, though. The rigorous study required will help prepare your student for college-level courses. They will be challenged to dig deeper into a subject, and having AP classes and exam scores can help your student stand out for college admissions. As you encourage your student to reach higher, be sure that the college they attend will reward their efforts. You can find schools that are very generous with merit aid by checking out our Merit Scholarship Toolkit today! Older PostWhat is the Difference Between a College and a University?